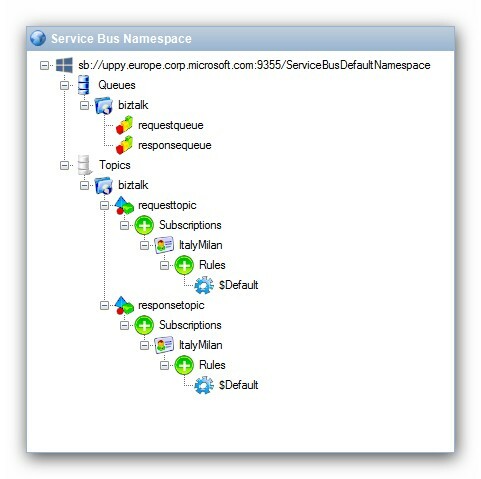 This sample uses a Service Bus namespace, queues, topics, and subscriptions. The first step is to create the namespace, the queues, topics, and subscriptions. The sample solution is available to download at How to integrate BizTalk Server 2010 / 2013 with Service Bus for Windows Server. Provides Azure Service Bus messaging capabilities on Windows Server This sample uses a Service Bus for Windows Server namespace, queues, topics, and subscriptions. Download available at Service Bus for Windows Server. The Visual C# and BizTalk Server projects are created in Visual Studio 2013. If you are using Visual Studio 2010 Service Pack 1 (SP1), the Visual C# projects may open successfully. A BizTalk Server 2013 project requires Visual Studio 2013. A BizTalk Server 2010 project requires Visual Studio 2010. Provides access to the Microsoft Azure Service Bus and Service Bus for Windows Server. Install Service Bus for Windows Server. Install the latest Azure SDK. Click .NET and then click your Visual Studio version. To open the BizTalk project, BizTalk Server must be installed on the Visual Studio computer. BizTalk Server 2013 requires Visual Studio 2013. BizTalk Server 2010 requires Visual Studio 2010. Modify the binding file in the Setup folder to create the receive locations and send ports used by the BizTalk application. Modify the namespace in the App.config configuration file used by the client application. 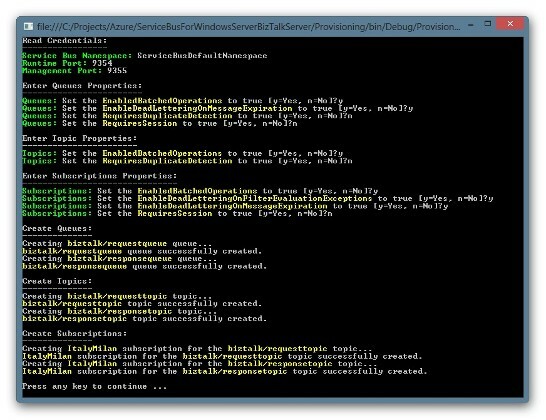 Change the namespace in the GetEndpointBehaviorConfiguration method of the ResponseManager class contained in the BusinessLogic project. 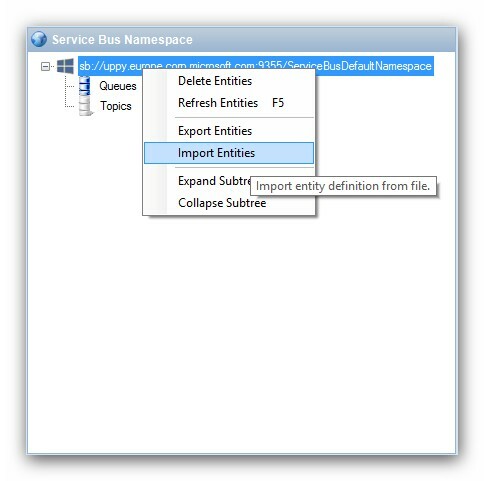 Included in this sample, it uses the NamespaceManager class to create the queues, topics, and subscriptions. Run the Provisioning application as a user account that is in the managers group of this namespace. Namespace information, including name, management port, and runtime port. A queue named requestqueue used by the client application to send request messages to BizTalk Server. A queue named responsequeue used by BizTalk Server to send response messages to the client application. A topic named requesttopic used by the client application to send request messages to BizTalk Server. A topic named responsetopic used by BizTalk Server to send response messages to the client application.